Banner and Ribbon Combo Package for SPECIAL OP's 800 Divisions $78 value for $62 The banner comes with everything you need on it. You don’t have to add anything extra to it. In fact there are no extras to add. You just fill in the information and it will be personalized for your Recruit/Sailor. It is handmade from Black Twill Fabric. All edges are finished, it's approximately 15" wide by 20" tall and has two loops at the top for hanging it. It has your Sailors Name, Ship, Ship number, Div Number, PIR Date and everything shown in the the picture. It folds small to fit in a Ziploc bag and fits in your purse or luggage making it easy for travel. You can iron it from the back on cotton setting to remove wrinkles before hanging and is even machine washable. 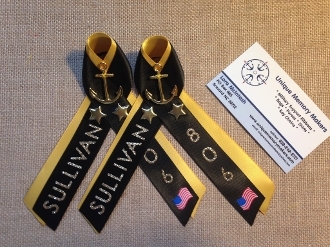 You also get 4 PIR double colored Black and Yellow/Gold ribbons with Gold colored anchors, stars and letters. If your recruit has other close family members who have served or are serving in the military I will add an American Flag to the ribbons to honor the family’s military history. The ribbons come with a pin on the back, so you can wear it on your shirt or dress. You also get a FREE Window decal of your choice. This package deal saves you money $$$ and is ALL handmade by a fellow Navy Mom. These are the Original PIR ribbons that all others being sold or made today were inspired by.